What Is The Definition Of A Government? There are many historical and current types and forms of governments to help govern the societies of our world. 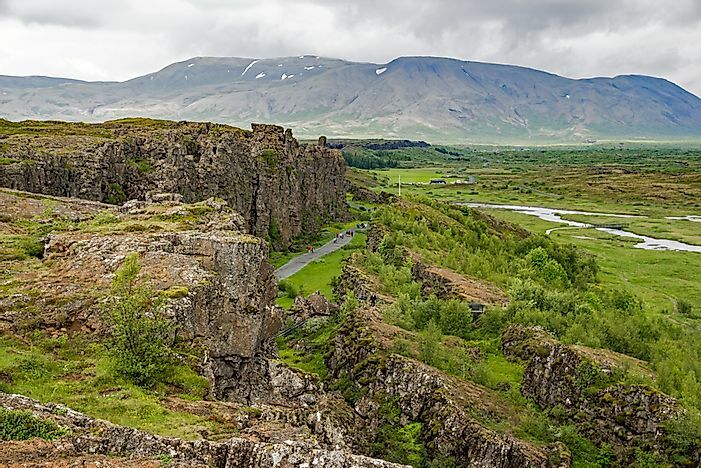 The Lögberg (Law Rock) in Iceland, where from 930 AD until 1262 Iceland held outdoor parliament meetings in what is now the Þingvellir National Park. The government is the system that controls a country, state, municipality, city, or other political entity. When we say a political party or ruler is in control of the government of a country, we simply mean, that that political party or person is controlling the system of running the country. Each type can have further sub-types. For example, a democratic government could be a presidential or parliamentary democracy. Autocracy’s subdivisions are Dictatorship, Absolute Monarchy, and Constitutional Monarchy. Dictatorship is where one individual gains power, generally through force, and everyone has to follow his decisions, for example, Adolf Hitler (Germany) and Fidel Castro (Cuba). Absolute Monarchy is where the highest power is vested in the hands of a monarch who rules the state, usually for life and by inheritance. The monarch in such cases can make all the decisions without approval or advice from anyone. On the other hand, the powers of a Constitutional Monarch are restricted by a constitution, parliament, or even by custom. Generally, such monarchs have ceremonial roles only. In modern times, many countries, such as Belgium, Great Britain, and Denmark, have moved away from absolute monarchy in favor of moving towards a constitutional monarchy. Democracy is a government carried out by the "representatives" who are elected by the people. It has two main flavors, namely Presidential and Parliamentary democracies. For example, in this light the United States could be said to be a Presidential Democracy, and Canada a Parliamentary Democracy. Democracy is usually practiced in the form of a Republic, in which people’s elected deputies (in the form of proxies or representatives), and not the people themselves, form and shape and implement the government and its functions. Less commonly seen, a pure democracy or direct democracy would involve deciding manners by way of popular vote and referendum directly without the use of representatives. Certain ancient Greek city-states carried out direct democracy to great extents, as do such modern practices as referendums, and the system long seen in Switzerland where in many cases citizens are given a more powerful vote than in any other place in the world. Oligarchy is also known as a government ran by the few. The term is derived from the Greek words for "few ruling in command". In this form of government; power effectively resides with a small group of individuals whose authority is generally based on wealth-based, intellectual, family, military, or religious hegemony. A Unitary government is when all of the governing power resides with the central government, and which does not share power with any other entity (such as a province or state). However, the central government delegates authority to sub-national units, and sends the policy decisions down for implementation. Examples of this in contemporary times include Afghanistan, Bolivia, Cuba, France, Spain, and the United Kingdom. Federal government is a form of government in which power is divided between a central (Federal) authority and a number of constituent regions (such as states, provinces, or colonies) so that each constituent retains some management of its own matters. This system is characterized by a strong central body and relatively weaker regional bodies. Present-day examples include Australia, Belgium, Brazil, Germany, India, Mexico, and Venezuela. A Confederation system of government is formed by an agreement among states, provinces, or territories. The constituting entities retain substantial independence and give only a few powers to the central body. A historical example of a confederation included the Confederate States of America (1861-1865) in what is now the Southern United States, and the United Arab States (1958-1961) of Egypt, Syria, and parts of present-day Yemen. Another unique form of governance (or lack thereof) is that of an "anarchy". In an anarchy, there is no hierarchy, and all domestic matters and social affairs are carried out voluntarily by the people. However, whether this theory would work in large-scale practice remains to be seen. Simply stated, without any process of governing society, it would be virtually impossible for a country to have any trade, commerce, healthcare, research, social welfare, and educational activities. When there is no government or process of regulating interaction among people, the civilized society will crumble, and only the powerful will survive, though these two may be subjected to violence and theft. Therefore, a government is needed to establish justice, protect human rights, and ensure and foster human development. What Is The Definition Of A Buffer State? What Is The Definition Of A Dynasty?